Why do I own these books? Save Me, Kurt Cobain is a terrific YA novel by author Jenny Manzer about a teenage girl who believes there’s a chance the late rock legend Kurt Cobain is her father. Part mystery, part coming-of-age, and all heart, I loved this unusual story and wish it would find its way into the hands of more readers. 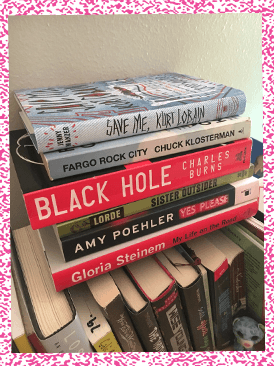 Fargo Rock City by Chuck Klosterman is one of the many nonfiction books by this music critic and pop culture writer that I inhaled in one setting. Klosterman writes so intelligently about why everyday stuff like reality television and dead rock stars matter so much, and his fiction is super impressive, too. Black Hole by Charles Burns is one of many graphic novels that I’ve read and loved. Black Hole tells a story about a mysterious sexually transmitted disease that morphs teenagers into hideous creatures with tails and scales. Creepy, funny, and smart, it’s not for everyone but it’s one of my all-time faves. Sister Outsider by Audre Lorde is a collection of brilliant essays by a black lesbian feminist whose writing from decades ago is as relevant and insightful as ever. There’s a reason I mention her name in my book Moxie, and it’s in the hope that young readers will seek out her work. Yes Please by Amy Poehler is a hilarious and deeply genuine memoir by one of the funniest people in show business, and I’m not just saying that because Amy Poehler has optioned my novel Moxie for film! Yes Please is part autobiography but also part guidebook to living your life as a brave, badass, creative woman, and I loved it. My Life on the Road by Gloria Steinem is also a memoir by one of the women’s movement’s most important voices. In this collection, Gloria draws connections between her travels and her work for gender equality. Accessible and fascinating, this is a must-read for any feminist! Find out more about Moxie here and The Truth About Alice, which comes out in the UK in March, here.